In 2016 economic growth will decrease to 3% due to less agriculture output and decreasing exports. 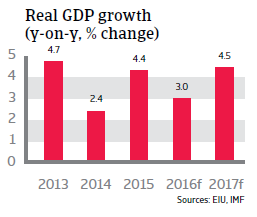 In 2017 GDP is expected to rebound again, growing 4.5%. The political situation is rather stable. King Mohammed VI holds most political power in his hands. There is no immediate threat to the monarchy and establishment as the King is popular with the people. He continues to cautiously liberalise the political system and to reform the economy. Maintaining political stability is highly dependent on reducing the high levels of poverty and youth unemployment in Morocco, otherwise an increase in social tensions cannot be ruled out. 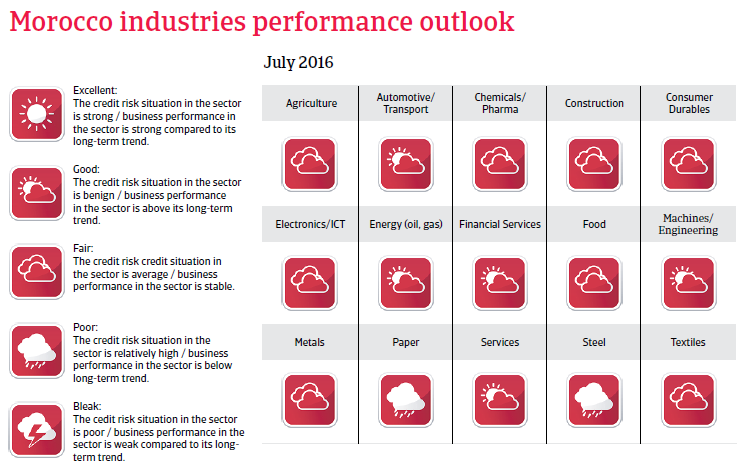 In 2016 economic growth is expected to slow down 3%, mainly due to a drought affecting the agriculture sector. The country is still highly dependent on agriculture, which employs some 40% of the workforce, and swings in agriculture output have a major impact on private consumption and the economy. 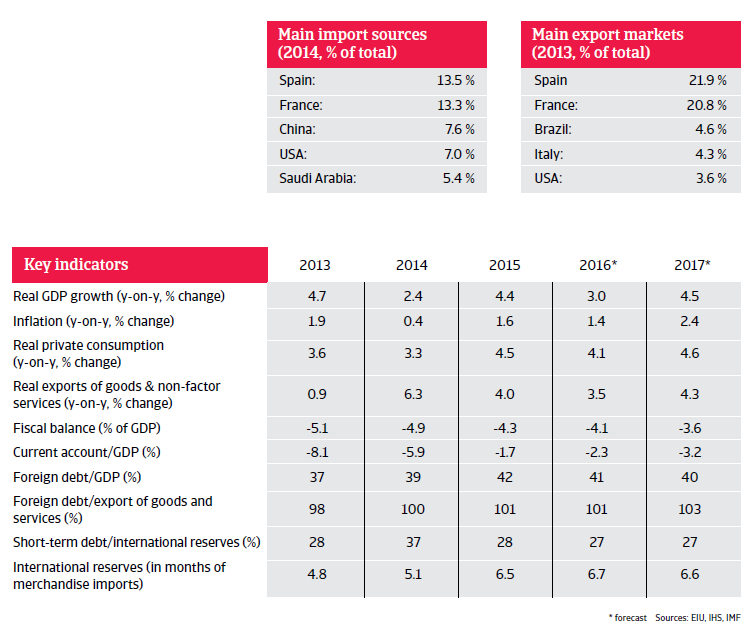 Exports will be affected by weaker external demand, especially from the Middle East and Africa. In recent years, the government has increased efforts to diversify the economy by developing industrial manufacturing, especially export-driven sectors (cars, aeronautics and electronics). Those efforts are increasingly paying off, with the favourable investment environment attracting foreign investment, especially in the car and electronics industries. Large investments in renewables and gas-fuelled power plants are boosting electricity production. Government finances have improved due to consolidation efforts, e.g. in 2015 fuel subsidies have been cut. 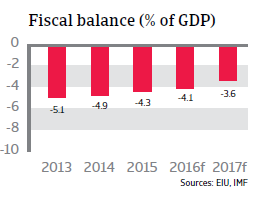 The fiscal deficit decreased to 4.3% of GDP in 2016, and further decreases are forecast in 2016 and 2017. 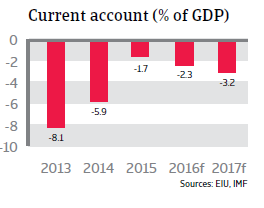 In 2015 the current account deficit decreased to 1.7% of GDP due to cheaper oil imports and rising exports. However, in 2016 an increase to 2.3% of GDP is expected due to weaker exports and increased food imports. Financing the structural current account deficit with foreign loans and foreign direct investment has been no problem so far. In the long term, it is expected that the high dependency on oil imports will decline as the government is investing in renewable energy. Morocco’s solvency position is acceptable, with foreign debt amounting to 41% of GDP in 2016. The liquidity position is good and expected to remain stable at more than six months of import cover in 2016. Morocco has access to a two-year precautionary liquidity line (PLL) with the IMF, and while it is not expected that the government will access the facility, it nevertheless helps Morocco’s reform programme and signals creditworthiness. Currently the dirham is tightly managed against a basket of currencies, but it will move to a more flexible exchange rate mechanism, as the central bank is planning to change the exchange rate regime gradually. A potential downside risk to the Moroccan economy remains any deterioration in the eurozone, which is a major export destination, for workers´ remittances and tourism inflow.